The Doberman Pinscher is a member of the Working Group of dogs. This breed is hailed for its loyalty, determination, attentiveness, and fearless nature. The Doberman is extremely sleek and powerful, and is considered one of the most intelligent breeds. It’s because of these qualities that the Doberman Pinscher is often used to assist law enforcement officials and other similar roles. However, don’t let their austere physique and sometimes brutish nature fool you; Doberman Pinschers also make excellent companions. If you are looking for a dog that is loyal as they come and will protect you and your loved ones to the ends of the earth, then you should definitely consider bringing a Doberman into your family. While they are fierce protectors, they can also be very playful; they’ll play with automatic fetch machines and interactive dog toys all day, if you let them. Dobermans also love cuddling and a good belly rub, and they definitely enjoy cozying up in a comfy dog bed and taking a nice snooze. And, since this breed is so intelligent, your Doberman will quickly pick up all of the tricks and command that you can find in a dog training book, making him one of the most well-behaved pup’s in your neighborhood. If you are considering bringing a Doberman Pinscher into your family, providing him with the right care is essential (the same as it is with any other breed). One of the most important parts of responsible pet ownership is feeding your pup a well-balanced diet that meets his nutritional needs. Contrary to what a lot of new pet owners think, if you want to ensure that your Doberman is eating right, you can’t just pick up any old dog food; you have to make sure that you are filling his dog bowl with one of the premium quality dog food brands that features wholesome ingredients and is fortified with the essential vitamins, minerals, and nutrients that a Doberman needs to thrive. Picking the best dog food for Dobermans is a bit more challenging than you might think. Walk into a pet food store and you’ll find that there are a dizzying area of options; dry dog food, organic dog food, wet dog food, and dog food for allergies are just some of the different options you’ll find. Add to that all of the different brands and choosing food for your Doberman can be pretty overwhelming. To help make things a little easier for you, we’ve taken the liberty of doing the legwork for you. After consulting with a panel of experts and reading through dozens of reviews, we’ve narrowed down the options to what we consider to be the very best dog food for Dobermans. Now that you’ve had a quick look at our top picks for the best Doberman food, let’s take a closer look at each option. Below, we offer a more detailed overview of each food, including the ingredients that they contain, what we like about them, and what other customers who have used each food have had to say. After you read through the reviews and decide on an option that you think will work best for your Doberman, click on the buttons to find the best prices currently available on Chewy and Amazon. 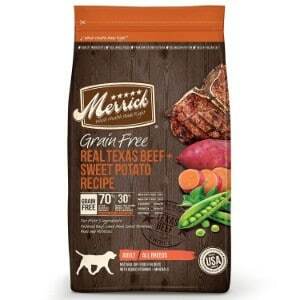 Merrick dog food is one of the highest quality options on the market. This manufacturer is hailed by pet parents for creating a variety of formulas and using only the best possible ingredients to ensure that the nutritional needs of canines are being met. Their grain free dog food is a great choice for Dobermans because, not only is it completely free of soy, wheat, corn, and other grains, but it’s also packed with protein, and omega 3 and omega 6 fatty acids; all nutrients that are crucial for the health and well-being of a Doberman. These nutrients help to support the development of lean muscle mass and can prevent joint issues, minimize skin issues, and strengthen the immune system. This formula is ideal for Dobermans that are allergic to grains or who have trouble digesting them and need a dog food for sensitive stomachs or allergies. The first ingredient in this recipe is beef, which has been carefully deboned. Beef is a great source of protein, and it also offers a palatable flavor that your Doberman will love. Sweet potatoes, white potatoes, and peas serve as easily digestible carbohydrates to fuel your Doberman’s energy. Other wholesome ingredients include apples, blueberries, flaxseed oil, and salmon oil. This recipe has also been infused with other essential vitamins, minerals, and nutrients, to provide your pup with the well-balanced nutrition that he needs. Based on the reviews that we read, most pet parents who have used this formula are very pleased with the results. Final Verdict: If your Doberman suffers from tummy issues or allergies, or if you just want to make sure that he is getting the best possible nutrition, Merrick Grain Free Dry Dog Food is an outstanding option. Made with premium ingredients and offering the right amount of essential nutrients, you can be sure that your pet will be eating right. 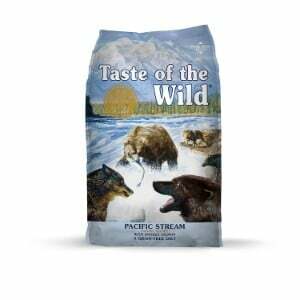 Next up on our list of the best food for Dobermans is an option that comes from Taste of the Wild dog food. This manufacturer is also highly regarded among pet parents, as they use only the best possible ingredients and create a variety of formulas to satisfy the instinctual cravings of canines. Their Grain Free Premium Dry Dog Food is an excellent choice for Dobermans because it offers up a healthy dose of protein, the building block of strong, healthy bones and joints, which is extremely important for this breed, as they are prone to joint issues. What really sets this formula apart is that instead of using meat-based proteins, like beef and chicken, this recipe uses salmon as its primary source of protein. Not only is salmon packed with amino acids, but it also contains omega 3 and omega 6 fatty acids, as well as a variety of other nutrients that are essential for your Doberman’s health. This grain free formula also features a medley of fresh fruits, vegetables, and superfoods, such as blueberries, raspberries, dried chicory root, and yucca. And, instead of using grains like soy, wheat, and corn, known allergens for dogs, sweet potatoes, lentils, white potatoes, and other easily digestible carbohydrates are featured. It’s also fortified with a wealth of vital nutrients, such as B vitamins, vitamin A, and vitamin D. Plus, since there aren’t any artificial preservatives, colors, flavors, or additives, you can be sure that your pooch will be getting all of the goodness that he needs and none of the harmful stuff that he doesn’t. Final Verdict: Taste of the Wild Grain Free Premium Dry Dog Food is an excellent choice for your Doberman. Not only will it satisfy his dietary needs, but it will also make his taste buds very happy. Wellness dog food is known for offering nutrient-rich food options that meet the unique dietary requirements of dogs of all breeds, ages, and sizes. Their Complete Health Natural Dog Food is specifically formulated for large breeds, like the Doberman. Not only does this formula contain wholesome ingredients and the vitamins and minerals that your pup needs to flourish, but it has reduced calories. Since excessive weight can lead to health problems, if your Doberman is getting a little big around the middle, this dog food for weight loss will keep him full and energize him while keeping his weight in-check. 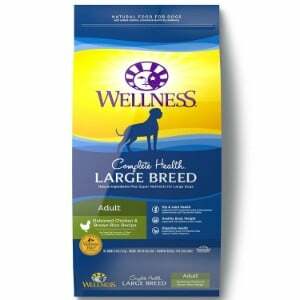 The ingredients used in Wellness Complete Health Natural Dry Large Dog Food are quite impressive. Deboned chicken is the first ingredient, so your puppy pal will be getting the protein that he needs to keep those joints and muscles healthy. It also contains easy to digest carbohydrates, such as oatmeal, brown rice, and barley, that will fuel his energy without causing stomach upset or skin irritations. A bevy of fruits and vegetables, including spinach, carrots, apples, and blueberries add to the wholesome goodness and the flavor; and the infusion of vital nutrients, like glucosamine, iron, and manganese, will help to ensure that your pup is getting the balanced nutrition that he needs. Final Verdict: If your Doberman needs to shed some weight or you just want to make sure that he doesn’t end up carrying too much weight, Wellness Complete Health Natural Dry Large Dog Food is a great choice. It has fewer calories than other formulas to prevent weight gain, and it also offers a completely nutritional profile to keep your pup in ideal health. 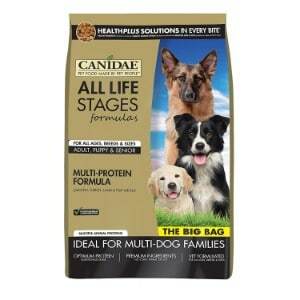 If you’ve recently adopted a puppy Doberman and you don’t want to keep changing his food as he grows, or you have Dobermans of varying ages, Canidea All Life Stages Dry Dog Food is a fantastic option. Like all Canida dog food formulas, this recipe is made to meet the nutritional needs of large dogs, like the Doberman; however, it’s meant to support those dietary needs from the time that he is able to start eating solid food until he reaches his golden years and needs a senior dog food. In other words, it’s a one-size-fits-all ages dog food. This recipe contains optimal levels of amino acids, thanks to the varied proteins that it features, which include chicken, turkey, and lamb. Protein is the building block of healthy joints and bones, so this recipe will certainly ensure that your Doberman is getting the protein that he needs. Other ingredients used in this formula include brown rice, cracked pearled barley, oatmeal, and other carbohydrates that your dog will be able to digest with ease, thereby preventing an upset stomach. Cranberries, tomatoes, and other real fruits and vegetables, offer balanced nutrition and add to the palatable flavor. And, since there is absolutely no corn, wheat, or soy used in this recipe, it’s a great choice for canines that are sensitive to gluten or who have sensitive stomachs. Final Verdict: Whether you have a Doberman puppy or senior Doberman, Canidae All Life Sages Dog Dry Food will ensure that he is healthy at any age. 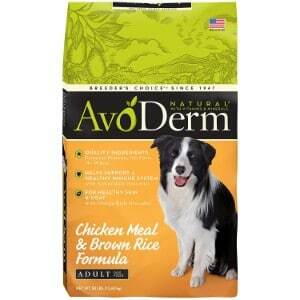 The last recipe featured on our list of the best dog food for Dobermans is AvoDerm Natural Dry Dog Food. This recipe is unique in that it’s one of the few types of dog food that we have found that uses avocados. These fruits are considered a superfood, as they are packed with vital nutrients, like vitamins A, C, E, and B6, folate, niacin, potassium, fatty acids, crude fiber, and healthy fats. In other words, avocados are outstanding for Dobermans. But that’s not the only reason why this food is a good choice for your Doberman; it also contains a variety of other healthful ingredients and can be used throughout all life stages. The combination of avocados and chicken offers up a healthy dose of protein, so you can have peace of mind knowing that your Doberman is getting the nutrition he needs to support his joint and bone health. Ground brown rice, oatmeal, and other easy to digest carbohydrates fuel energy levels without causing adverse reactions. And, the infusion of essential vitamins and minerals, such as copper, vitamin E, vitamin A, and vitamin B12 will keep your four-legged friend’s health in tip-top shape. Final Verdict: If you’re looking for a unique food for your Doberman that is rich in vital nutrients, AvoDerm Natural Dog Food for Adults is an excellent option to consider. Made with real chicken, avocados, and other wholesome ingredients, it will certainly keep your pup’s health in-check throughout all life stages. Just like humans, our canine companions require the very best nutrition in order to live a long, happy, and healthy life. However, the nutritional needs of canines vary from breed to breed. Doberman Pinschers, in particular, have very distinct dietary requirements. In order to ensure that you are providing your pup with the balanced diet that he needs to thrive, it’s crucial that you select a premium quality dog food that offers all of the vitamins, minerals, and nutrients that this breed requires. Dobermans are very lean, muscular, and active dogs. As such, they require a healthy dose of protein in their diets. For adult Dobermans, animal nutritionists recommend they consume between 15 and 30 percent protein on a daily basis; for puppies, the daily protein intake should be between 22 and 32 percent. The more active your pup is, the more protein he will need to thrive; but, do be cautions. Since this breed has a genetic predisposition to kidney disease, feeding your pooch more protein than he needs could be problematic. If you aren’t sure how much protein your four-legged family member needs, consult with your vet. Dobermans also require healthy fats, like omega 3 and omega 6 fatty acids. These nutrients help to strengthen their immune system. They also promote skin health, as they prevent the skin from drying out; a problem that is not uncommon among Doberman Pinschers. Since Dobermans are very active, they also need carbohydrates, as they fuel their energy. However, stick to complex carbs, such as whole grains, as simple carbs can cause health issues, like canine diabetes. If, however, your Doberman is sensitive to gluten, you can opt for wholesome fruits and vegetables, like sweet potatoes, which pack plenty of energy and burn slowly, so they’ll keep your pup feeling fuller longer. By-product meals. By-products, as the name suggests, are derived of the by-products of animals, such as hooves, bones, and other undesirable ingredients. A little likely won’t cause health issues; however, if he eats too much, it can cause serious problems. Artificial colors and flavors. While these agents might make the food taste better and look better, they can be dangerous to your dog. They can cause allegoric reactions, stomach issues, and a number of other problems. Artificial preservatives. You should also stay away from foods that contain artificial preservatives. They make the food stay fresher longer, but they can wreck havoc on the gastrointestinal tract. With so many different food options on the market, how did we narrow down the choices and pick the five options listed in our review? We enlisted the help of a panel of experts, which included animal nutritionists and veterinarians. Together, we discussed the nutritional needs of Doberman Pinschers and discussed the health issues that this breed is prone to. With this information in mind, we assessed the ingredients in dozens of different brands and formulas. Based on our findings, we were able to narrow down the options to the five that are featured in our review. If you want to ensure that your Doberman Pinscher is as healthy as possible, you are going to want to feed him a premium quality food. All of the options listed in our review are outstanding sources of nutrition for Dobermans. They are made with the best possible ingredients and are packed with the essential nutrients that this breed needs to thrive.